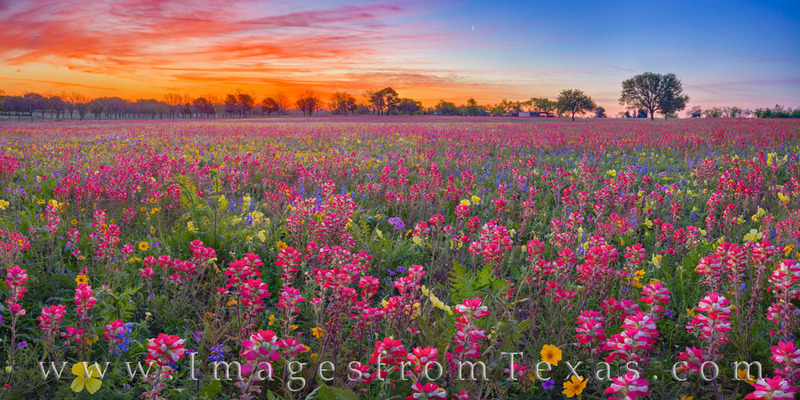 From the rural community of New Berlin, Texas, this panorama shows a field of colorful wildflowers at sunrise. Made up of phlox (purple), gold (primrose, tickseed, and coreopsis), bluebonnets, Indian paintbrush (red), and several other varieties, this amazing morning had it all, including a beautiful sky. The air was cold - in the 30s - and frost covered the soft petals of these spring blooms. The land was at peace, and the only sounds were the distant calls of wild turkeys roaming the area. This wildflower panorama was taken on private land upon an invitation from the owner. This wildflower panorama is available in larger and custom sizes. Photo © copyright by Rob Greebon.